In the middle of China, there’s a town called Hengdian 横店. In this town, there is a movie lot that is bigger than the studios of Universal and Paramount put together. This is the Hengdian World Studios, aka “Hollywood of the East”. It attracts production teams from all over the world, and as a result, creates a new label in the Chinese population – “Hengpiao”, which literally means the “Hengdian Nomads”. These people are mostly extras on the movie set, and they’re usually perceived as those who dream of becoming movie stars. The story evolves around several young people chasing their dreams in Hengdian. They have no knowledge in moviemaking, and they bumbling misadventures turn out to be valuable lessons for their lives. Director Yee wishes this film could inspire countless “nomads” from all walks of life. The obstacles that we’re facing would become the greatest gifts of our lives. This is also perhaps the least star-studded film ever. Made up of a cast with extras, about extras, “I Am Somebody” features the dreams of the young people, the harsh reality they have to face, as well as the life decisions they have to make. Some people say the plot resembles Stephen Chow’s 1999 King of Comedy (喜剧之王), but I guess getting a professional actor to act as an extra versus having extra acting as extra is very different. Professional actors might have difficulty covering up their “shine” and perform their lines with the same “raw” and newbie-way as the extras. While there were flaws in the chosen cast’s acting, it is perhaps those gawkiness that brought humour to the audience. The actor who impressed me the most was this Chen Kai 沈凯 who is the “over-aged” big brother in the film, taking care of the new extras who came to Heng Dian to pursue their dream. But when he finally had a notable role with plenty of lines, his wife decided to leave him and the stress from the director and the pain of the divorce drove him mad. The moment where he was making mistakes after mistakes, the amount of stress and embarrassment he was getting was immensely strong, and I guess that’s the very moment where audience who had never tried acting before could feel the difficulty of acting and filming. When I was watching this film, although there weren’t many audience, there were quite a lot of laughters at moments which I didn’t think it was funny. Perhaps I saw parts of me in the characters, I even saw some of my freelance actor friends in them. Wei Xing 魏星 is an extra actor who managed to get lucky initially and acted in a music video. He refused to take up extra roles later on and stay at home all day, waiting for “bigger” and more important roles. This was such a deja vu as that was the exact advice a few freelance actors (who were more experienced than me) told me, do not take up extra roles anymore as the casting director will treat you as an extra forever. While the film talks about the different dreams each extra has. But Anita Yuen’s advice to the other two extras was the real food for thought. Be it in the acting industry, or whichever industry you are in, there will be times when you question yourself or even your partner, if you are taking the right path or if you are doing the right thing. Anita said something along the line, how can you be sure that you won’t succeed when the future hasn’t arrive? Of course, this film is not aimed to inspire or “encourage” more people to be an extra in Heng Dian. For more than once, the different characters questioned one another, if acting is what they want to do. Why do they want to act? Some advise to just give your self a few days (or months) to have fun and go home after that. I like how the director was able to pass the message of “Pursue and persevere what you want to, but give up when you have to.” And similarly, be brave to pursue your dreams, at least you have no regrets even if you’ve failed. The film is made up of the extras Director Derek Yee met some of the extras during a set visit. He was touched by their live stories and decided to write and direct a film with these extras as leads. The names of the actors were their real names and they were asked to act out their own lives (with no proper scripts) but with pseudo lives. Several actors were supportive of the film and show their support by promoting it on their weibo even when they aren’t in the film. Notable actors like Anita Yuen (袁咏仪), Daniel Wu (吴彦祖), Stephen Fung (冯德伦), Alex Fong (方中信) and Henry Fong (方平) became the “extras” for this film and cameoed as themselves. 10 award-winning Chinese directors arrived at the press conference to promote the film. Among the 10 of them, they’ve won 72 Golden Film Awards. They are 尔冬升 Derek Yee, 许鞍华 Ann Hui, 刘伟强 Andrew Lau, 麦兆辉 Alan Mak, 庄文强 Felix Chong, 赵良骏 Samson Chiu, 陆剑明 Jamie Luk, 罗志良 Law Chi-leung, 张经纬 Cheung King Wai, 李光耀 David Lee Kwong Yiu. All of them contributed in one way or another. Some cameoed in the film, some assisted with the production, and director 赵良骏 Samson Chiu even provided training for all these extras who have zero experience in acting. 4 of the directors (许鞍华 Ann Hui, 刘伟强 Andrew Lau, 麦兆辉 Alan Mak and 庄文强 Felix Chong) appear in the film as cameo directors. Director Derek Yee 尔冬升 always focus a lot on pre-production research. He researched for 5 months for the film Endless Love (新不了情), prepared 10 years for the film Shinjuku Incident (新宿事件) and for the film Protégé (门徒), he found enough information about drug dealings to film 20 movies. For this film “I Am Somebody”, he and his team of 9 other directors made more than 200 interview clips and gathered more than 1 million-word material (enough for a 60-episode drama). He nearly gave up filming this movie, but the ones who gave him the most confidence and motivation were the “extras” characters in the movie. 2 guys who chose to become extras after coming out from reservist cried when they saw director Derek Yee, they said, “There was never a director who said a single word to me” (and he’s the first). Check out I Am Somebody (我是路人甲) Official Weibo! 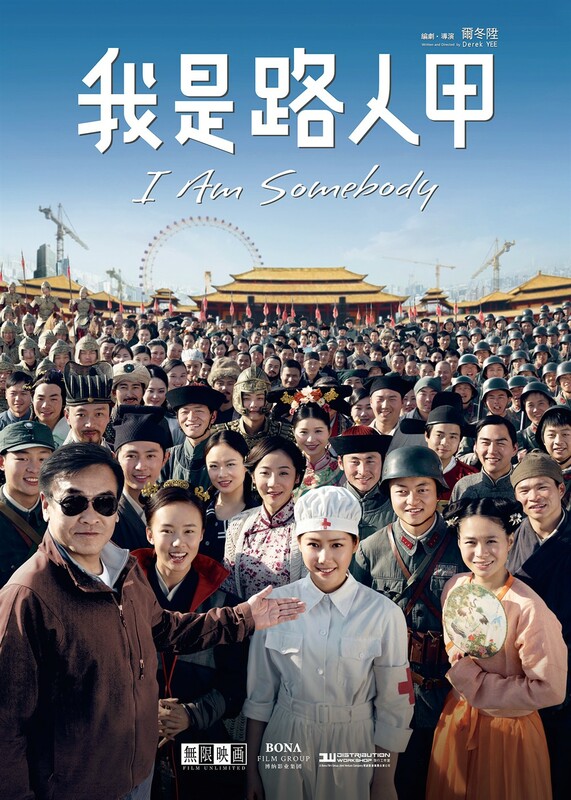 I Am Somebody (我是路人甲) is out in cinemas on 16 July 2015. WOW. The amount of research that went into it is really intensive, the million word material was probably very difficult to pick through. I really am interested in watching this, to understand more about the lives of those who are not in the lead, but make the film better anyway. Thank you Tiffany for recommending this movie. It is a must-watch for all non-famous actors like us. I cried throughout the show because I could feel so much for the actors. The things they said and did were so familiar to me. My husband isn’t an actor but he enjoyed the show just as much. I believe this show would inspire anyone who has a dream. It’s a pity it’s not well-marketed in Singapore. I wish more people would watch this movie and get inspired by it. I guess this film didn’t reach theaters here in our place. Nevertheless, the film plot sounds interesting. It really helps us understand the struggles in the acting industry. This looks like a good movie to watch. Looks like a great movie and totally agree that people go for big blockbusters and not those meaningful movies. This is the kind of film my husband would love to see as it is filled with action. I will tell him about this. I might go to watch this movie if it screen in Malaysia. It all about behind the scene and also the struggles as an actor or actress. This show is a must see for freelance talents and those who dream of being an actor. A few of the characters portrayed in the show by real freelance extras and some of their line are actual lines they used. I thoroughly enjoyed the show and couldn’t get enough of it. Do go on youtube to catch the interviews of the actors and director on 2 talk shows. Must see for freelance talents, extras, calefares, etc. I haven’t heard of this film here in England, its certainly seems full of action and adventure. something my brother would enjoy for sure.